Landscaping creates the framework which lovingly displays your home to its greatest advantage. Underestimate the value of landscaping and you could literally be tossing dollars to the wind. The Gallup Organization estimates that effective landscape design can add up to 15% to the value of your home. And properly situated trees and shrubbery can substantially reduce (up to 50%) both cooling and heating costs of your home. Between homes of perceived equal value, distinctive landscaping can add 6-7% to the sales price. And the benefits extend far beyond the financial. For most of us, our home is an extension of ourselves. As someone walks to our front door, we want the first impression they receive to be positive. While we enjoy our backyard, we want to minimize outside intrusion. When we add and subtract from our landscape design, we want to make sure our environmental impact is positive. Whatever currency you use, exceptional landscape design can only add to your sum total of happiness. 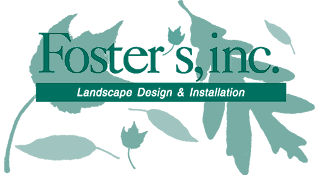 Foster’s is a member of the Connecticut Nursery & Landscape Association, and the American Nursery & Landscape Association.